Enjoy the fantastic "Capability" Brown landscaped gardens, explore the house with its wonderful art or play in the famous childrens adventure playground. Only 5 minutes away. Set in rural Wiltshire, Lacock village is famous for its picturesque streets, historic buildings and more recently as a film and television location. Now is your chance to follow in the footsteps of Harry Potter, Elizabeth Bennet and the residents of Cranford. Lacock Abbey, Fox Talbot Museum, Courtyard Tea Room, Stables Cafe and Shop all open daily. This historic, Victorian picturesque landscape and internationally important tree and shrub collection is managed by the Forestry Commission. With treetop walkway and kids playground, it's a great family day out. Enter a land of adventure. Where lions roam. Tigers stalk. And monkeys swing. Travel through time in a grand stately home. Hold exotic creatures from the ends of the Earth. So beautiful and special that it has been designated a World Heritage site. The only place where you can relax in the naturally hot spa water and original roman style baths. Nestled in a scenic valley, Dyrham Park comprises 270 acres of ancient deer parkland, the stunning 17th-century home of William Blathwayt and a 21st-century garden with echoes of the past. Deer park, garden, shop & tea-room. This beautiful 15th century medieval manor sits in peaceful countryside. Cross the upper moat, passing barns, gatehouse and delightful parish church to enjoy fine oriel windows and the soldiers, griffons and monkey adorning the rooftops. Featured in Poldark, Wolf Hall and The Other Boleyn Girl. A breathtaking 18th century landscape garden with lakeside walks, grottoes and classical temples. Visit Stourhead House, a Palladian mansion with a fantastic regency library and beautiful art collection. Climb the 205 steps to the top of King Alfred's Tower, an amazing red-brick folly, for vistas over Dorset, Somerset and Wiltshire, or explore one of the Iron Age hill forts. Among the most famous groups of megaliths in the world. The two sanctuaries consist of circles of menhirs arranged in a pattern whose astronomical significance is still being explored. These holy places and the nearby Neolithic sites are an incomparable testimony to prehistoric times. Castle Combe is a quintessentially English village often named as the ‘prettiest village in England.' The village sits in the Cotswolds Area of Outstanding Natural Beauty in north west Wiltshire. Castle Combe has featured regularly as a film location, most recently in The Wolf Man, Stardust and Stephen Spielberg’s War Horse. 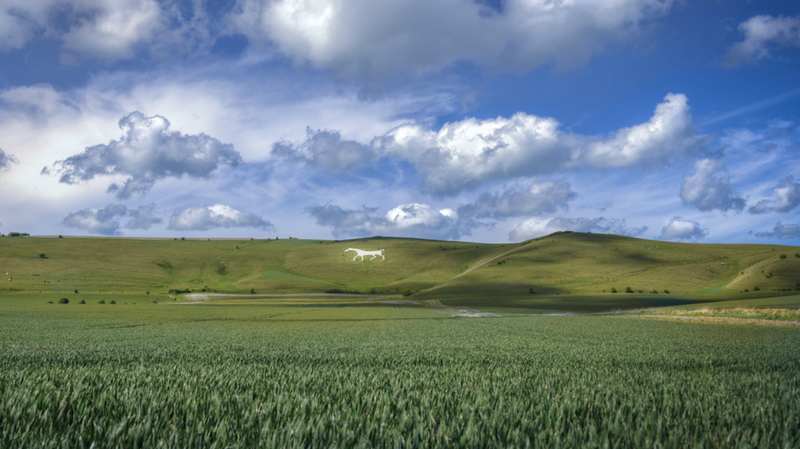 Visit one of Wiltshire's 8 white horses, the Cherhill white horse can be viewed from our village pub garden.